Two great tastes. Better together. Eighty-six percent of executives who use videoconferencing daily want even more ways to use video, according to a new survey from Wainhouse Research. What does that mean? Those who already use videoconferencing - the peanut butter - are bought in. They see the value it delivers in reducing travel costs, increasing productivity, and improving the bottom line, and want to explore new use cases for video. They want “the chocolate” to get even more from their experience. Well, we have good news for those folks! The technology is already in place to enable these use cases, and it’s called live streaming. Now, you can have your peanut butter cup and eat it, too! 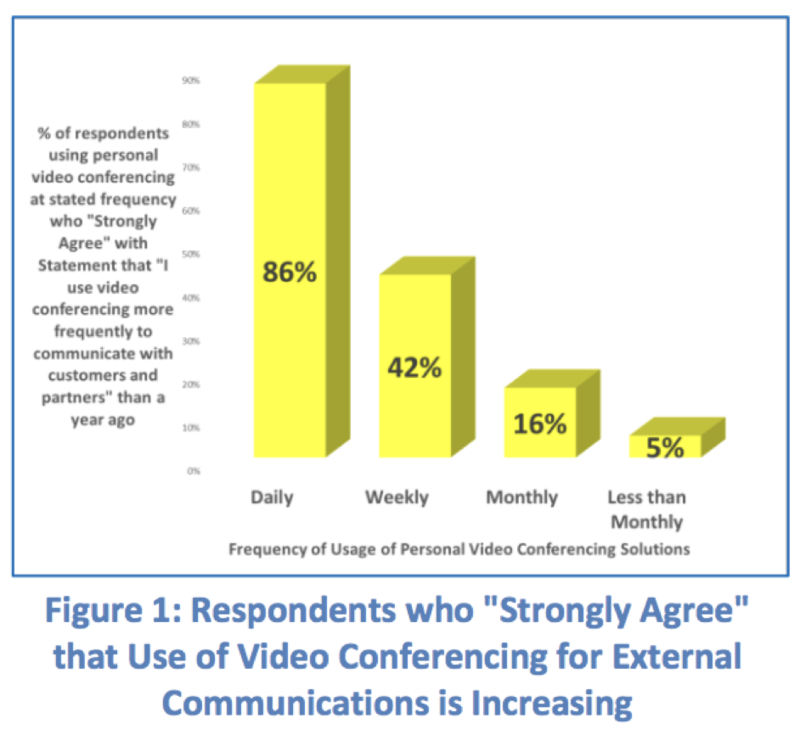 “Four out of five surveyed agree that their organization should use video more extensively.” - Wainhouse Research, Enhancing the Value of Video Conferencing in the Enterprise. For many professionals, video is confined to scheduled meetings or ad hoc chats with colleagues, but it doesn’t have to be. Video can help you reach a broader audience and extend the life of your content by making it available on-demand. Live streaming brings your message to the masses. It also can make video more ubiquitous in an organization, driving more usage among those who already use video on a regular basis. Even sweeter? The combination of videoconferencing and live streaming. As Wainhouse Research points out, most videoconferencing platforms lack the ability to manage content and distribute it to large groups. Live streaming excels here, and presents online video to big audiences so they can access it when and where they want. Companies are catching on to this complementary toolset, too. Thirty percent of organizations have implemented technologies that combine group videoconferencing and streaming platforms, and another 41 percent are interested in doing so. With videoconferencing and live streaming together, the business benefits are infinite. Survey respondents report that streaming video offers a more cost-effective way to conduct training (49 percent), can make presentations more engaging (47 percent), and can foster online interaction (88 percent). Companies can stream any meeting, creating countless possibilities for use. For instance, employee training is the most common use case for live streaming, with 66 percent of respondents using it for that purpose. However, others use stream for help desk support (61 percent), employee onboarding (55 percent), and town hall meetings (52 percent). Live streaming also brings your content to people on any device, anywhere in the world. Today’s employees are no longer bound to their desks; they work at home, in coffee shops, and anywhere with a WiFi connection. Organizations are adapting to these new styles of work by enabling mobile access to content, with 34 percent of respondents supporting content distribution to smartphones, up from just 19 percent in 2013. Videoconferencing no longer exists in a vacuum. While great for small team collaboration, organizations can see even more ROI by combining it with live streaming to reach a broader audience. Because peanut butter is great, but wouldn’t it be better with chocolate? To read the full research findings from Wainhouse Research, please click here. You can also watch a recording of our recent webinar with Wainhouse here. IT Managers: Are You Ready for the Olympics?